The following table shows the primary hybrids (species x species) between those species in the Dircaea clade most frequently used in hybridizing. This is not likely to be a complete list, but it should provide some guidance about what things have already been done. Notes for each species provide additional information about secondary crosses and other potentially useful information. All primary crosses between species in the Dircaea clade should produce fertile hybrids. As far as I can tell, adding more Dircaea-clade species to the mix does not prevent them from being fertile. Peter Shalit, Ruth Coulson, Dale Martens, and others have created fertile hybrids which have quite a number of these species in their ancestry. Special thanks to Ruth Coulson, Jon Lindstrom, Dave Zaitlin, and particularly Peter Shalit for their contributions to the information in the table below. In the 1960s, Carl Clayberg did a set of crossing experiments between species of Sinningia (and Rechsteineria). He included five members of the Dircaea clade: S. cardinalis, S. douglasii, S. eumorpha, S. leucotricha, and S. lineata. For the complete results, see the crossing chart. For our purposes here, it suffices to note that he showed that all ten possible combinations (considering A x B and B x A to be the same) produced fertile hybrid plants. The Clayberg Ten crosses are marked with a 10 in the table. Presumably, all the crosses are fertile. The ones I know to be fertile or which others have reported to be fertile are marked F, the others X.
S. bulbosa x S. cardinalis 'Skydiver' John Boggan made this cross in the 1980's. He (or Peter Shalit) selfed it, and Peter saved a white-flowered, peloric seedling which went into the gene pool that led to his hybrids including 'Bewitched' and 'Tomorrow'. Ruth Coulson received a plant labelled "(Skydiver x macrorrhiza) x bulbosa" [S. macrorrhiza is a synonym of S. bulbosa], and this was one of the parents of S. 'Serenade'. S. bullata x conspicua: Jim Steuerlein did this cross. He reports that the tubers are hardy to 21 F [-6 C]. S. bullata x eumorpha: Mauro Peixoto did this cross. See here for a picture. S. bullata x macrostachya: Jim Steuerlein did this cross. S. bullata x insularis: Wallace Wells did this cross. As of February 2010, it had not yet bloomed. 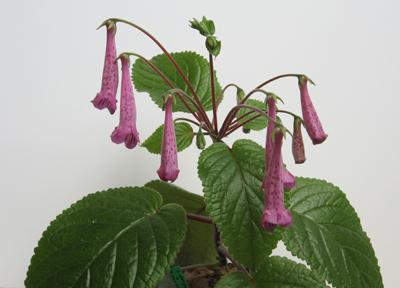 S. bullata x leopoldii: A plant has been found on the island of Florianopolis which is believed to be a natural hybrid between these two species. Mauro Peixoto has distributed seeds of this plant, so the seeds are the F2. I have gotten plants from sowing seed from the F2 plant. Sinningia cardinalis x douglasii: One of the Clayberg Ten from the 1960s. I do not know of any plants of this cross currently in existence. Sinningia cardinalis x eumorpha: One of the Clayberg Ten from the 1960s. It was the source of the "Gloxinera" hybrids, back when Rechsteineria and Sinningia were considered two different genera, and S. cardinalis was a rechteineria. S. eumorpha x cardinalis was registered by D. Horton as S. 'Bernice' in 1960. In the July-August issue of the 1956 Gloxinian, Peggie Schulz described her plant S. 'Velvet Charm'. It was S. eumorpha x cardinalis 'Splendens', hybrid seed produced at Cornell University, presumably by Carl Clayberg or one of his students. S. 'Velvet Charm' has been back-crossed to S. cardinalis (S. 'Curly Audrey' and S. 'Jeanie', both registered 1963 by A. G. Belchier; and S. 'Glox-News', registered 1963 by Ted Bona). Sinningia cardinalis x glazioviana: Peter Shalit sent me a picture of this cross that he had saved on his computer, possibly from the Gesneriphiles mailing list. Imagine the trailing habit of S. glazioviana and the orange-red flowers and green foliage of S. cardinalis: that's what the hybrid looked like. Peter did not know who the hybridizer and/or grower were. Sinningia cardinalis x leucotricha: One of the Clayberg Ten from the 1960s. See the page on this cross. Seed of S. cardinalis x leucotricha was offered in the (defunct) American Gesneria Society's seed fund listing in 1971 (in Gesneriad Saintpaulia News). Sinningia cardinalis x lineata: One of the Clayberg Ten from the 1960s. I do not know of any plants of this cross currently in existence. Sinningia conspicua x glazioviana: Ruth Coulson did this cross. She says it does not have well-shaped flowers but has a long flowering period. Sinningia conspicua x iarae was done by Dan Tomso (information from Peter Shalit). As in the case of S. eumorpha x iarae, the foliage, flowering pattern, and calyx are all from the non-iarae parent. S. iarae left traces of itself only in the corolla color and shape. Sinningia douglasii x eumorpha: One of the Clayberg Ten from the 1960s. Brad Walker did the cross pictured at the right. Sinningia douglasii x glazioviana: This cross was registered in 1992 by Colin Rampton as S. 'Dreamtime'. Sinningia douglasii x lineata: One of the Clayberg Ten from the 1960s. I do not know of any plants of this cross currently in existence. Sinningia douglasii x leucotricha: One of the Clayberg Ten from the 1960s. Mauro Peixoto offers F2 seeds from this cross, which suggests he did it too. I did the cross a few years ago, and have F2 seedlings coming along, but they have not yet bloomed (as of June 2008). See the page on Sinningia douglasii x leucotricha. Sinningia eumorpha x iarae was done by Dan Tomso (information from Peter Shalit). See picture at right. The foliage, flowering pattern, and calyx are all from S. eumorpha. S. iarae has left traces of itself only in the corolla color and shape. The same is true of S. conspicua x iarae. Sinningia glazioviana x eumorpha was one of the parents of 'Texas Gift'. 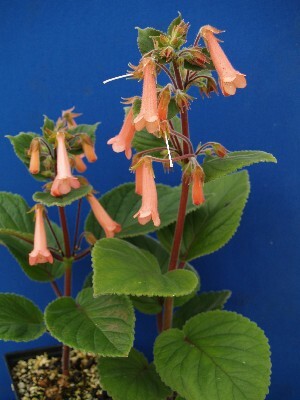 Sinningia leopoldii x eumorpha was registered as S. 'Rosemary' in 1997 by Ray Coyle of the New York chapter of the Gesneriad Society. Sinningia eumorpha x lineata: One of the Clayberg Ten from the 1960s. In 1957, C. B. Sheperd registered "S. macropoda x eumorpha" as S. 'Coral Gem'. Although S. macropoda was in cultivation at the time, most of what was grown under that name was actually S. lineata, so this hybrid was probably S. lineata x eumorpha. The cross S. eumorpha x canescens was registered in 1979 by J. C. Fant as S. 'Maureen Burke'. It is likely that this was actually S. eumorpha x leucotricha. Sinningia eumorpha x leucotricha: One of the Clayberg Ten from the 1960s. According to Peter Shalit, Marion Rendell of New Jersey also made this cross in the 1960s and crossed it with S. cardinalis x eumorpha. Peter had one of the resulting plants for many years, and it was one of the ancestors of his hybrid 'Bewitched'. Sinningia eumorpha x conspicua: Brad Walker did this cross. See the picture of the flower at the right. Sinningia iarae x cardinalis was done by Colin Rampton, who also crossed S. iarae with S. cardinalis 'Skydiver' and S. cardinalis 'Innocent', getting plants that were visually identical. Ruth Coulson has crossed S. iarae x cardinalis 'Skydiver' with S. conspicua. Sinningia hatschbachii x leucotricha: Ingrid Lindskog did this cross, which has not bloomed yet for her. She says the seedlings resemble "polar bear cubs". Sinningia hatschbachii x lineata: Ingrid Lindskog did this cross, which has not yet bloomed for her. Sinningia iarae x leucotricha is Colin Rampton's hybrid 'Apricot Down' (registered 1993). Sinningia iarae x piresiana: Bruce Dunn, Jon Lindstrom's graduate student at University of Arkansas, made this cross. Sinningia glazioviana x hatschbachii. Hybridizer: Alan LaVergne. See the page on this cross. Sinningia macropoda x glazioviana. Hybridizer: Colin Rampton. Registered in 1993 as S. 'Sun Blaze'. In 2001 Colin Rampton registered S. 'Ablaze', which was 'Sun Blaze' x a hybrid of S. cooperi, the only time that I know of that the latter species has been used in hybridization. Sinningia insularis x conspicua. Hybridizer: Jon Lindstrom. See picture at right. Jon Dixon has a plant of this cross that he bought at a convention in the 1990s. He believes that the plant was raised by Maryjane Evans from seed provided by Dave Zaitlin. Dave is not sure whether he did that cross. Jon Dixon's plant has pink flowers, and he says this proves that red-orange x yellow = pink. Sinningia insularis x piresiana. Hybridizer: Jon Lindstrom. See the notes on this cross. Sinningia leopoldii x leucotricha: Ingrid Lindskog made this cross and got a set of plants to which she gave alphabetically-ordered girl's names, starting with Anita. Sinningia leucotricha x bulbosa: John Boggan made this cross in the 1980's and Peter Shalit still has a plant grown from that seed. Sinningia leucotricha x macropoda I acquired from Mike Kartuz. I am not sure who did the cross. It is a very nice compact plant with orange-red macropoda-type flowers. Sinningia leucotricha x macrostachya is one of Jon Dixon's found-in-pot hybrids. Seed from open pollination of this plant germinated in November 2008, so it is (as expected) fertile. See the page on this cross. Sinningia lineata x glazioviana is Colin Rampton's hybrid 'Sun Blaze'. It is given as S. macropoda x glazioviana in the Register, but the first-named parent is probably -- like that of S. 'Peninsula Belle' -- S. lineata. Sinningia lineata x leucotricha: One of the Clayberg Ten from the 1960s. I do not know of any plants of this cross currently in existence. Sinningia lineata x reitzii is S. 'Peninsula Belle'. Hybridizer: Alan LaVergne. See the page on this cross. Sinningia macropoda x piresiana: Peter Shalit made this cross recently. It has not yet bloomed. Sinningia macrostachya x conspicua: Al Wocjik made this cross. Sinningia macrostachya x piresiana: Bruce Dunn, Jon Lindstrom's graduate student at University of Arkansas, made this cross. Sinningia piresiana x cardinalis Daniel Steele made this cross. The corolla is magenta and piresiana-tubular. Daniel writes that the external streaks typical of piresiana are just barely visible in this hybrid. See here for pictures. Sinningia piresiana x conspicua Brad Walker made this cross. It has the external streaks typical of piresiana and its hybrids. He did not mention whether it is fragrant. Sinningia piresiana x eumorpha 'Salt�o' Peter Shalit made this cross. Dave Zaitlin grew it from seed provided by Peter and says the plants are sterile. Peter says it will not self but produces lots of pollen. Brad Walker reports that he has set seed on his plant (which he got from Kathy Spissman) and got a few seedlings (pollen from S. conspicua). Jim Steuerlein has crossed this hybrid with S. bullata. Sinningia piresiana x leucotricha. Hybridizer: Jon Lindstrom. See the page on this cross. Sinningia reitzii x calcaria. Hybridizer: Alan LaVergne. Seeds from this cross germinated in January 2009. Sinningia reitzii x cardinalis. Hybridizer: Alan LaVergne (but it is very likely that others have done this cross too). Seeds from open pollination of this plant have germinated, so it is (as expected) fertile. See the page on this cross. Sinningia reitzii x eumorpha, done by Nancy Gilson (and quite possibly others). Sinningia reitzii x iarae. Hybridizer: Alan LaVergne. See the page on this cross. Sinningia reitzii x leucotricha is S. 'Toronto Ten'. Hybridizer: Alan LaVergne. See the page on this cross. Brad Walker registered S. 'Herbert Walker' in 2006, giving its ancestry as S. eumorpha x (leucotricha x reitzii). P. Conner registered S. 'Island Silver' in 1989, giving its ancestry as S. reitzii x (S. canescens x 'Alruth'). It is likely that the "S. canescens" was actually S. leucotricha. S. 'Alruth' is a Ted Bona cross between S. lineata and a multi-generation cardinalis/eumorpha hybrid. Sinningia bulbosa: Since my plants of this species won't bloom, after a half dozen years, I am compelled to believe tales of hybridizing with it are myths. Sinningia bullata: Jim Steuerlein has crossed this one with S. muscicola ("Rio das Pedras") of the Corytholoma clade and with Sinningia sp. "Black Hill" of this clade. See here for his cross with S. polyantha. 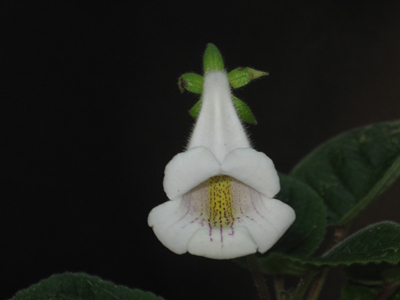 Sinningia calcaria: Peter Shalit crossed S. calcaria with his hybrid S. 'Tomorrow'. 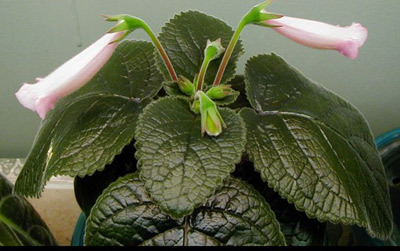 See a picture on the Gesneriad Society website. The compact habit and red-backed leaves should be desirable traits for hybridizing, but the species does not usually bear a lot of flowers. Sinningia cardinalis: There have been many secondary hybrids involving this species, especially its white and peloric variants S. cardinalis 'George Kalmbacher', S. cardinalis 'Innocent', and S. cardinalis 'Skydiver'. Sinningia conspicua: S. conspicua is one of the parents of Ruth Coulson's S. 'Serenade'. Peter Shalit has used S. conspicua in his hybrids too. Jon Lindstrom crossed S. conspicua with S. sp. "Ibitioca". Ben Paternoster crossed S. conspicua with S. amambayensis, and registered the result as S. 'Magic Moment' in 2004. I crossed S. conspicua with S. 'Peninsula Belle'. Sinningia douglasii: I have crossed this species with S. 'Distant Lights'. Sinningia eumorpha: S. eumorpha has been used extensively in sinningia hybridizing. There is a lot of eumorpha in the background of Dale Martens's S. 'Texas Zebra', for instance. Bill Price crossed S. eumorpha 'Salt�o' with S. sp. "Ibitioca", to get a nice hybrid. Dave Zaitlin says he used to have S. eumorpha x striata, which he thinks he got from Judy Becker. This primary cross is one of the parents of 'Texas Zebra'. Sinningia glazioviana: This species has been used in other hybrids, because of its long blooming season and bushy habit. Sinningia hatschbachii: This species ought to contribute hairiness to hybrids. Ingrid Lindskog's S. hatschbachii x leucotricha should be interesting. The obstacle to hatschbachii hybridizing is blooming season. Because S. hatschbachii blooms in the late autumn, while most other species listed here bloom in the spring, it's not easy to make the crosses. Sinningia iarae: Ruth Coulson says she has used S. (cardinalis 'Skydiver' x iarae) x conspicua in her hybridizing. She has also done S. iarae x nivalis. Sinningia leopoldii: My hybrid S. 'Distant Lights' is S. leopoldii x S. "Black Hill". Sinningia leucotricha: I have selfed S. leucotricha x cardinalis and crossed it back to a couple of varieties of S. leucotricha, so far without obtaining anything special. Sinningia macrostachya: Plants of this species and crosses between this species and others tend to be large, and may therefore not be suitable for light gardens. According to Peter Shalit, Judy Becker sells plants of S. macrostachya x 'Georgia Sunset'. Sinningia piresiana: I have crossed this species with S. 'Peninsula Belle'. See the page on this cross. Bruce Dunn, Jon Lindstrom's graduate student at University of Arkansas, has crossed S. piresiana with S. aggregata and with S. sellovii x tubiflora. Daniel Steele crossed this species with S. aggregata, of the Corytholoma clade. See here for pictures. Sinningia reitzii: Because this species blooms in autumn, it is not as easy to hybridize with as some of the others. Using an earlier-blooming hybrid of S. reitzii can make things easier, since reitzii's good points seem to come through even when it's just a grandparent, not an immediate parent.